I love the look of this garden (a Chelsea Flower Show winner back in 2009), with its myriad groundcovers and a smattering of ‘up’ plants. 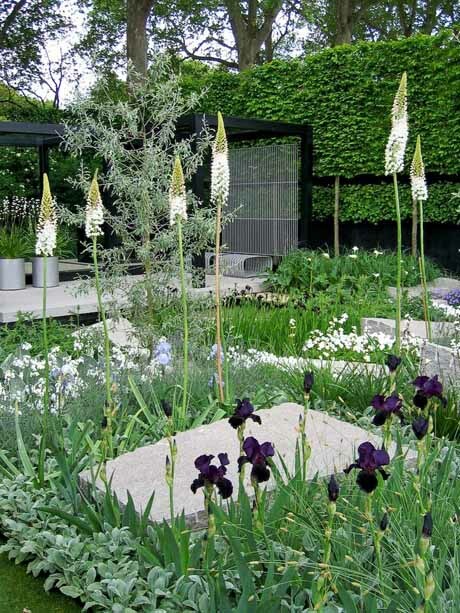 The tall white spiked plants are Eremurus ‘Joanna’ and the striking black irises are Iris chrysographes. Some of the other white flowers we can see are verbascum and stock (matthiola). The Daily Telegraph garden, designed by Ulf Nordfjell, won best in show that year. If you’d like to see more, click here for a virtual tour.